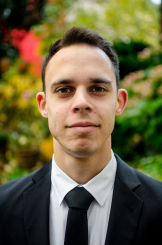 Jaret Choolun (born 1988) is an award-winning Australian composer and choral conductor resident in Berlin, Germany. From 2006-2010 He studied composition with Stephen Leek at the Queensland Conservatorium, simultaneously training his choral skills further by singing with, composing and conducting for The Australian Voices. In 2012 Choolun relocated to Bremen, Germany to direct a charming new music chamber choir for young singers, Northern Spirit, and in the following six years drove them to win awards at the 2015 Krakow International Choral Competition as well as two gold medals at the European Choir Games in 2017. Jaret’s entry into the VCM Foundation choral composing competition in 2017 was awarded second place and premiered by Voces8, one of Britain’s leading vocal ensembles. Early in 2018 Jaret expanded his focus to once again include instrumental writing, premiering his new work for chamber choir, orchestra and solo viola da gamba, Particles of Cosmic Dust. His recent commissioned work includes Sea Fever, a gift to Northern Spirit from a longtime friend of the choir Brendan Wiseman, and Desiderat, a work for choir and organ commissioned for the opening concert of the state of Niedersachsen’s celebration of 300 years of the organ builder Arp Schnitger. Since 2019 he lives in Berlin. Jaret Choolun (born 1988 in Melbourne, Australia), is an award-winning composer and choral conductor resident in Bremen, Germany. His early years were consumed by choral singing and the piano, and from 2006 until 2010 he studied composition with Stephen Leek at the Queensland Conservatorium, Griffith University. During this time Choolun discovered the true breadth of modern music for voices and was particularly motivated to pursue this in his writing, producing pieces for solo voice, unaccompanied choral music as well as chamber operas, and was awarded prizes and honourable mentions for his pieces from organisations such as the Australian Society for Music Education and the Barbara Blackman Prize. Concurrently Jaret sang with and composed for renowned ensemble The Australian Voices, led by Stephen Leek and later Gordon Hamilton. This included year-long residencies with the choir as Young Composer as well as Conductor in Training. In 2012 Jaret relocated to Europe and took over the direction of Northern Spirit, a chamber choir in Bremen, Germany, which had been founded by Gordon Hamilton with the special purpose of championing new Australian choral music away from home. As a choral conductor Jaret has driven Northern Spirit to win multiple awards, including the prize for best foreign choir performing a Polish piece at the 2015 Krakow International Choral Competition, and in 2017 two gold medals in the chamber choir division at the European Choir Games in Riga, Latvia, where among other pieces they performed György Orbàn’s Pange Lingua as well as Choolun’s arrangement of the Australian folk song Botany Bay. Also in 2017 under Choolun’s direction Northern Spirit produced its first CD, featuring his newest piece, Flight, among a collection of folksong arrangements and pieces from the Classical a cappella canon. In November 2017 Jaret received second place for his entry Lullaby for the Christ Child in the inaugural VCM Foundation choral composing competition and had the honour of attending a performance of his piece by renowned British ensemble, Voces8. Though Choolun’s focus is primarily vocal music, his work with instrumentalists has included collaborations with soloists, quartets and orchestras. Early in 2018 Jaret premiered his new work for choir, orchestra and viola da gamba, Particles of Cosmic Dust, a reflection on the late astrophysicist Carl Sagan’s novel Kontakt. His most recent contribution to music is Desiderat, a work for choir and organ commissioned for the opening concert of the state of Niedersachsen’s celebration of 300 years of the organ builder Arp Schnitger. Following a move to Berlin at the end of 2018, Jaret continues to collaborate with soloists, schools and choirs in Germany for new music projects.